Marriage is a notoriously difficult topic for novelists to write about; or perhaps, I should say, happy marriages are. Shakespeare is famous for not having one happy marriage in his entire oeuvre, and even Jane Austen, the patron saint of the marriage plot, includes mainly dysfunctional marriages (with the Crofts in Persuasion providing a most wonderful exception.) Her novels promise happy marriages, but she, conspicuously, never gets around to describing them. "Dear Reader, I married her" is a common way to describe the conclusion of many 19th-century love-plots, but the description of marital bliss is usually left up to the reader's imagination. The 20th century isn't much better, with writers spending more time on marital dysfunction and happy love affairs then on the ins and outs of actual marriage. 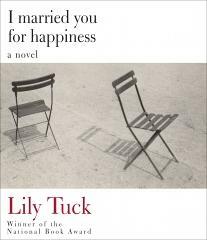 Lily Tuck's recent novel I Married You For Happiness faces the topic of marriage in all its shades of emotion without a blink. The result is thought provoking. Nina dries the lettuce for the salad and calls her husband Phillip down for dinner. When he doesn't respond, she climbs the stairs to the bedroom to find him dead of a fatal, and unexpected, heart attack. In shock, she sits by his bed for the rest of the night, replaying moments of their 43-year marriage in her mind. There are memories from vacations in Belle-Isle, how they met, arguments they had, joys they shared, disappointments they shouldered and throughout these, the unsettling thought that Phillip is gone and Nina must find a way to live without him. Nina wonders if he was happy, if he was faithful to her, if she was fair to him, if she made the right decision in holding truths back from him. The writing is brilliant and Nina's stream-of-consciousness so convincing, that the reader gets a clear picture of the complicated nature of marriage, this institution that requires two people to live together for many, many years. Though the novel is absorbing and the portrait of marriage unflinching, there is ultimately an unsatisfying element here. Perhaps it is the ending that opts for a supernatural conclusion, rather than something nostalgic or hopeful. Perhaps it is the nagging thought that Nina doesn't quite deserve Phillip. Maybe, finally, it's the unsettling realization that though Nina married Phillip for happiness, she never really found it, and that after 43 years, that's a major disillusionment. Despite this ambiguity, however, the novel is worth the read solely for the way it is told and the language it uses. Tuck can pierce a human emotion with a few words, and the spare thoughts, lean language that she employs to create complex moments are delectably artful.